This study examined the effect of a short cold water immersion (CWI) intervention on rectal and muscle temperature, isokinetic strength and 1-km cycling time trial performance in the heat. Ten male cyclists performed a 1-km time trial at 35.0+/-0.3 degrees C and 40.0+/-3.0% relative humidity, followed by 20 min recovery sitting in either cold water (14 degrees C) for 5 min or in 35 degrees C air (control); a second 1-km time trial immediately followed. Peak and mean cycling power output were recorded for both time trials. Rectal and muscle temperature, and maximal isokinetic concentric torque of the knee extensors were measured before and immediately after the first and second time trials. Rectal temperature was not different between cold water immersion and control conditions at any time points. After the second time trial, however, muscle temperature was significantly lower (-1.3+/-0.7 degrees C) in cold water immersion compared with the control trial. While peak and mean power decreased from the first to second time trial in both conditions (-86+/-54 W and -24+/-16 W, respectively), maximal isokinetic concentric torque was similar between conditions at all time points. 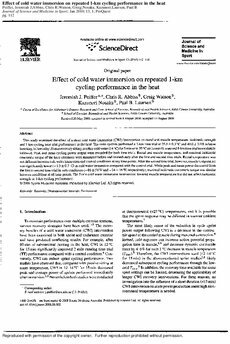 The 5 min cold water immersion intervention lowered muscle temperature but did not affect isokinetic strength or 1-km cycling performance.